Nick Saban might be the greatest (and grimmest) coach ever. Nick Saban might be the greatest college coach of all time. He’s definitely the grimmest. 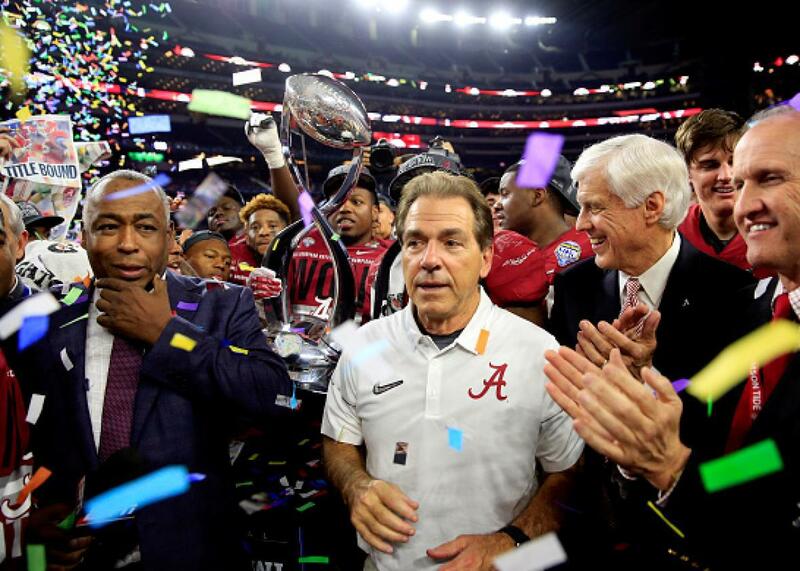 Head coach Nick Saban of the Alabama Crimson Tide celebrates after defeating the Michigan State Spartans 38-0 in the Goodyear Cotton Bowl at AT&T Stadium on December 31, 2015 in Arlington, Texas. This is what his celebration looks like. Nick Saban efforted a smile on national television Thursday night. As with the majority of the Alabama football coach’s public displays of emotion that vaguely resemble joy, it was brief and pointed and racked with awkwardness, which was also how Saban’s brief celebratory “dance” with the Alabama marching band came across a short time later. Other than perhaps his mentor Bill Belichick, there may no more joyless and perpetually dissatisfied man in sports than Saban. It’s this grim determinedness, though, that has him on the verge of becoming perhaps the greatest college football coach in the history of the sport. Saban’s team demolished Michigan State 38-0 in the Cotton Bowl on New Year’s Eve to advance to the College Football Playoff final. If his Crimson Tide defeat Clemson in the national championship game with the same kind of overbearing defensive performance, Saban will have claimed his fifth national championship as a head coach (one at LSU, and four with Alabama). That would edge him ever closer to Bear Bryant, the grandfatherly hound’s-tooth-hatted icon who led the Crimson Tide to six undisputed national titles in the 1960s and 1970s. One could argue that, given college football’s increasing parity over the past 20 years, Saban’s accomplishments eclipse even that of Bryant. And yet even if Saban wins, say, five more titles at Alabama after this season, he will never be as beloved as Bryant, simply because his approach purposefully wrings the emotion out of the sport. The Spartans are coached by former Saban assistant Mark Dantonio, who is not exactly given to public displays of warmth himself. With the victory, Saban is now 9-0 against his ex-assistants since 2010, outscoring them 349-88. The point is this: Nobody has mastered stern and disciplinary football on the college level like Saban, and no one ever will. Which is why the only way to beat Alabama is to somehow screw with Saban’s domineering sense of order. The teams that have beaten Alabama in recent years tend to be offbeat and unpredictable. Often, they are teams with mobile quarterbacks that run some version of a spread offense and toy with the tempo of the game by speeding up play. A few years ago, queried about the proliferation of up-tempo offenses in college football, Saban—who worked on the defensive side of the ball before becoming a head coach—decried them, asking, “Is this what we want football to be?” Since then, Saban has at least partially embraced the revolution: He hired disgraced USC coach Lane Kiffin as his offensive coordinator, and Kiffin has employed elements of both the spread and the hurry-up offense. Against Michigan State, the Crimson Tide surprised everyone by repeatedly putting the game in the hands of quarterback Jake Coker rather than Heisman Trophy-winning running back Derrick Henry. But even with that, it’s clear that Saban is far more comfortable imposing his own values on a game, particularly if it’s close, which is why Henry carried the ball 90 times in Alabama’s final two games of the regular season (Saban declared that giving the ball to Henry time and again was one of the few things that made him happy). The Tide lost in last year’s College Football Playoff to Ohio State, in large part because Buckeyes quarterback Cardale Jones and coach Urban Meyer managed to keep the Alabama defense perpetually off-balance. Alabama’s only loss this season is to the University of Mississippi, a school the Tide have fallen to two years in a row, largely because Ole Miss coach Hugh Freeze has also managed to overwhelm Saban’s fastidious nature. Until he took the Ole Miss job, Freeze was best known as lineman Michael Oher’s high school coach in Michael Lewis’ book The Blind Side. “Hugh thinks football is supposed to be fun,” Sean Tuohy, Oher’s guardian, told Lewis. There is hope, then, for a national championship that will at least manage to hold our attention, because Clemson has the potential to stretch Alabama’s defense in ways Michigan State couldn’t. Clemson quarterback Deshaun Watson was brilliant in a 37-17 win over Oklahoma in the other playoff semifinal at the Orange Bowl, and he presents the kind of run-pass threat that Johnny Manziel did when Manziel and Texas A&M stunned an undefeated Alabama team in 2012. Clemson has played with looseness all season under coach Dabo Swinney, who could crush Saban in a dance-off. Swinney has been playing the “disrespect” card all season in order to motivate his team, and since Alabama is already a favorite in Las Vegas, he’ll be able to do the same in the lead-up to the title game. But the key for Clemson will be to find a way to combat Saban’s attempts to reduce every game he coaches into a dreary and emotionless battle of wills. The best way to upend Alabama is to make football fun.